Amazon has completely changed the retail game. It’s hard to think of a company that has not been forced to adapt because of the e-commerce titan. I’m sure there are also a few that are no longer around because of them as well. In no way am I saying Amazon is a great investment. I actually have no idea if it is or not. How can you value a company that’s doing things nobody has ever done before? Thankfully that’s not how we spend our time. To be clear, we do not currently own Amazon and I am not recommending to go out and buy shares in it. I’m simply stating a fact. Amazon has changed the game. Which brings us to Steph Curry. If you are basketball fan, or a sports fan, or anybody that likes to watch a master at his craft…watch him play. In terms of pure basketball skill and IQ, his ability to handle the ball, create for others, and shoot it in…I have never seen anybody better. He is easily the most entertaining player I have ever watched and he’s single-handedly changing the game. He is the Amazon of the NBA. This post was spurred by an article by Cork Gains via Business Insider titled Stephen Curry Has Taken the NBA’s Biggest Trend to a New Extreme. 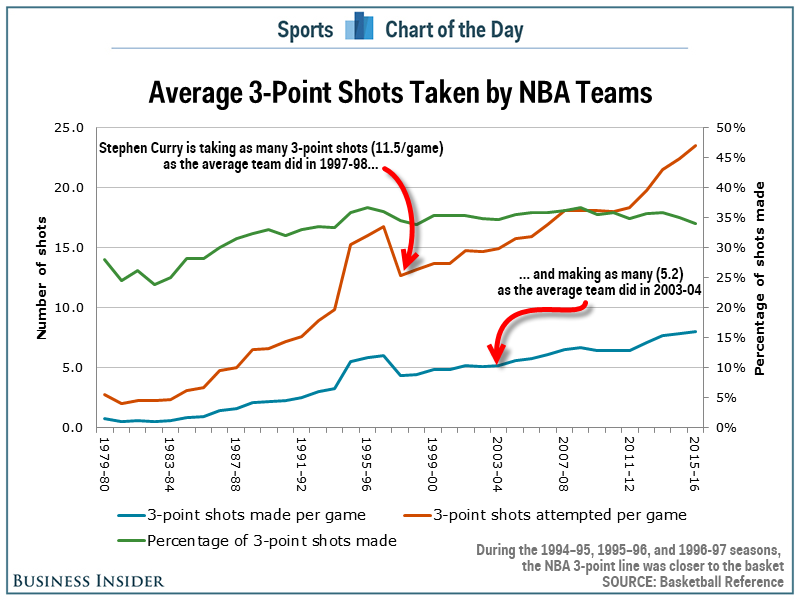 Steph Curry is now attempting more threes per game than the average NBA team did in 1998…and he is making a lot of them. Check out the chart below and the full article when you can. Do yourself a favor and watch him play. Guys like him, who have truly mastered their craft don’t come around very often.